First solo album for thirty years from the Status Quo keyboard player. I have to put this particular album down as one of my most pleasant surprises. As anybody who has read my contributions to this magazine will have no doubt realised, I have a lot of time for Status Quo. Not only have I really enjoyed their last batch of albums, I was fortunate enough to have covered Francis Rossi's second solo album (and subsequent live DVD) when that came out. Now, Andy Bown, who has been playing keyboards with Quo since the seventies (as well as additional guitars, harmonica and backing vocals) and who has co-written some of their biggest hits, is back with his first solo album in over thirty years. I had no idea what to expect from Andy as I'd not heard any of his solo work before. I knew he had a great musical pedigree, having played in The Herd with Peter Frampton and spent some time playing with Pink Floyd and Roger Waters. I also knew he had written or co-written some great songs for Quo. 'Unfinished Business' however, shows another side. 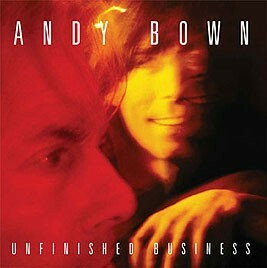 Andy has penned ten original tracks by himself, which he also handles lead vocals for - and what a great album it is. Opener 'Ruby And Roy' starts the proceedings in lively fashion, boasting a groove that's not too far removed from Quo themselves and has some great light-hearted lyrics. 'Rubber Glove' follows up with a more bluesy feel that works sublimely. Andy is not the most gifted vocalist in the world, but he can carry a tune and his use of Juliet Roberts and Sylvia Mason James on backing vocals to lift the choruses is an inspired decision. 'I Was There When The Lights Went On' is an entertaining autobiographical track chronicling Andy kicking off Live Aid with the opening notes of 'Rocking All Over The World', playing next to Jerry Lee Lewis, meeting Chuck Berry and Tim Hardin stealing his guitar. It also ends with a collection of legendary names Andy has encountered, which is pretty much a who's who of rock and pop legends - Tom Jones, Robert Plant, Brian May, Steve Winwood - right through to Rolf Harris! Other songs of note include the rocker 'Built To Last' and the blues work out 'Tick My Box', but frankly there wasn't a single track on here I didn't like. It's a quirky, varied and fun album with some funny lyrics and nice touches - it doesn't take itself too seriously. If you enjoy Quo's more eclectic side, it might appeal. Other comparisons I've heard liken it to early Dire Straits. Personally I thought that was a vague likeness, but what I did realise is an album I anticipated purely out of curiosity has turned out to be my most played album of the month. On top of that, it even comes with a bonus video. Top stuff from a top musician!